Zen Buddhist priests began creating their iconic Zen gardens for meditation and appreciation of beauty in the late 14th century. At first glance, the Zen garden is very simple. Yet, as one studies the space, the complexity unfolds. Elements of an Asian garden, the feeling of water with rock, and the raking of gravel to create the ripple-like appearance of flowing water. 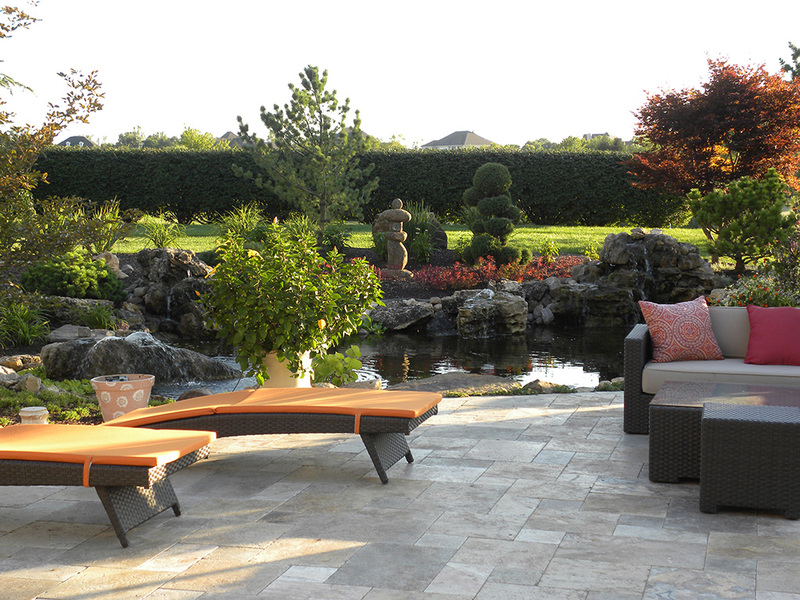 The role of stone cannot be over emphasized as it is the structural basis of the hardscape design. Other elements such as bamboo panels, fences, and gates are both functional and visual. Water can be added in the form of a trickling fountain or pond. Other common elements include pagoda lighting and Buddha figures of many forms and materials. So you have a shady garden? All of your hopes for a bright lush garden are doomed right? I think not. You just need a change of perspective. Just let go of the idea of a riot of bright colors. 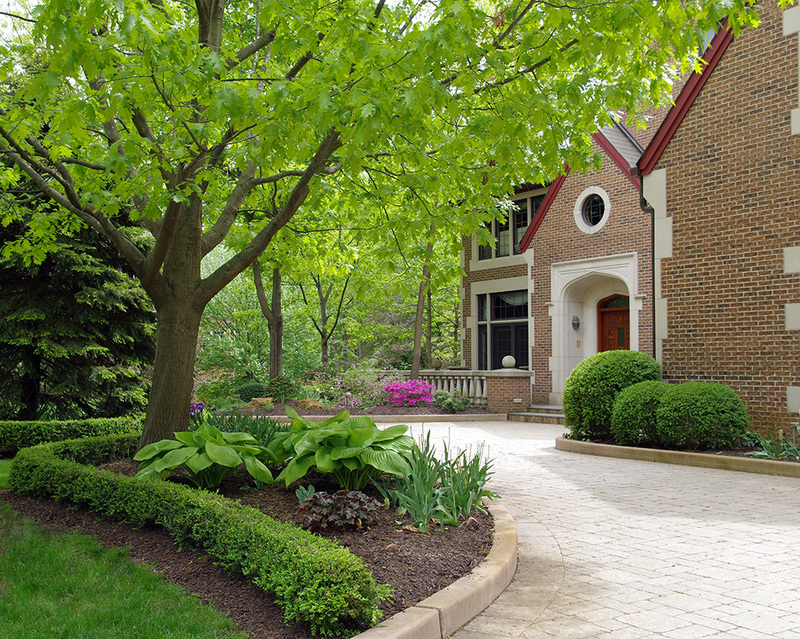 Instead, embrace the many different shades of green and layering of different shade-loving perennials, shrubs, and ground covers. I love to sit in on my patio surrounded by the garden I have crafted over the years. After a long day of work with the computer beeping, the phone ringing, and helping my clients and my team make it through the day, all I want to do is hear nothing. The best ‘nothing’ in my life comes from the sounds my garden makes. Sound isn’t often considered when we think about a garden. It takes a back seat to the more obvious sensations of sight and scent. It is officially summer. Winter is far behind us. It is the time when our gardens soar into their peaks of brilliance with countless flowers in an endless array of colors. Perennials have long been dating back to the late 19th century in England and the Royal Botanic Gardens. Of course, Perennials appeared before then, but that was the first large scale garden made almost entirely of perennials. Previous gardens included medicinal plants as well as roses and bulbs. Perennials are relatively easy to grow and offer an endless variety of colors, forms, and textures. Perennials bloom throughout the season at varying times. The ultimate goal of a well-planned perennial garden is a consistent flow of color through the summer while textures change and growth patterns between the plants become a dance. Other pleasing side effects of a perennial garden are the attractions to hummingbirds and butterflies while birds sing in nearby trees. Of course, the wonderful fragrance of a perennial garden is an added bonus. To plant a garden is to believe in tomorrow. There is no question that the world is increasingly urban. As landscapers, this poses the question of; how do we landscape an apartment or a tiny patch of ground covered in concrete? The answer is a container garden. We have experienced fantastic growth in container gardening. A container garden is made up of hanging baskets and containers on the ground. They let you create attention-grabbing focal points with billowing blooms of color and greenery. 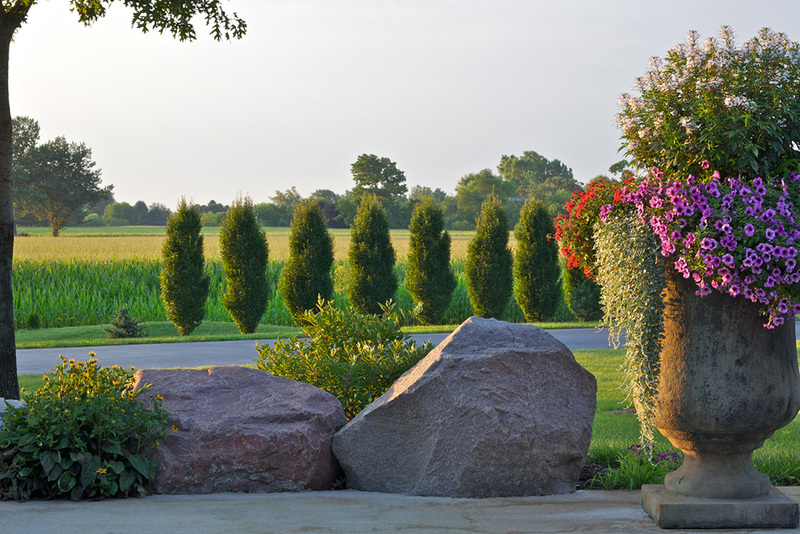 Historically, containers were only planted in the summer with annuals. We have expanded into switching out the contents seasonally and using more and infinitely varied plants in the containers. Serene, Simple, Sophisticated, Romantic: Just a few words to describe a white garden. A white garden entails white flowers combined with silver and blue toned foliage. The overall effect can be quite calming. A dark backdrop hedge such as Yew, Boxwood, or Holly sets off the bright white flowers, Small hedges can also be used to divide the garden into formal planting beds with each bed planted with different varieties of white flowers. When in bloom each bed overflows with a solid mass of white. Blooms erupt from behind the dark green hedge outlines. A white garden can be formal or informal; It can include a mix of flowering shrubs and trees or it can be a mix of bulbs, annuals, perennials and vines. Where will your white garden be?